Local golf star Haley Moore earned a coveted invite to the inaugural Augusta National Women’s Amateur. Photo by Lenny Kerbs. Though he was fast on the football field, OG’s Moray Steward has proven to be even more fleet of foot when it comes to track. Photo by Lenny Kerbs. Now that the seasons have transitioned and spring has begun to take hold, it seems an apropos time to fire away with some more laptop snapshots. So here goes with what I think, know or believe. But be advised to proceed at your own risk. After all, we aren’t engaging in exact science here. Though sportswriters like to think of ourselves as being on top of things, infallibility isn’t exactly one of our strong suits. The tennis facility at the local Kit Carson Park has developed a reputation for being a place where motivated tournament and league players congregate in order to hone their games and challenge themselves against testing competition. It seems as if participants from all over North County and beyond have decided that the courts at KCP have plenty to offer while becoming a tennis Mecca of sorts. And a speaking of tennis, is the sporting public fully aware of the wonders of the seemingly ageless Roger Federer? The 37-year-old Swiss master just took care of business down in Miami, winning a pro title for a staggering 101st time. No one over the last 10 to 15 years has combined such artistic grace with unworldly athletic aptitude. There used to be a time when fans were quick to compare the accomplishments of Tiger Woods and Federer and hotly debated who was the more dominant in his respective sport. As of now, there can no longer be any discussion. Federer left El Tigre in the rearview mirror long ago. Here’s hoping that “Fed” continues to defy the encroachment of age and stays relevant on the scene for the foreseeable future. It’s hardly hyperbole to say that his like will never be seen again. I’ve seen cactus flowers that appeared to have lasted longer than the ill-fated American Alliance of Football which prematurely closed up shop this week. And that’s a shame because the product was more than palatable and some of rule changes where quite intriguing. The postmortem of what went wrong will be interesting to dissect. The winningest local softball team thus far this season has been the Golden Eagles of San Pasqual, who have already put 11 games in the victory column. Talented senior Raquel Moore has been the go-to performer for SP, not only doing yeoman’s work on the mound but also pacing the club in batting average (.457), hits (21) and RBIs (15). I recently caught the 35th anniversary showing of the Karate Kid at a nearby theater and it held up quite admirably. Some actors are simply destined to play and shine in a particular role and that certainly was the case with Pat Morita. He gave breath and life to his depiction of the honorable Mr. Miyagi and made everyone of us wish we’d had such a wise and reasoned mentor in our lives. 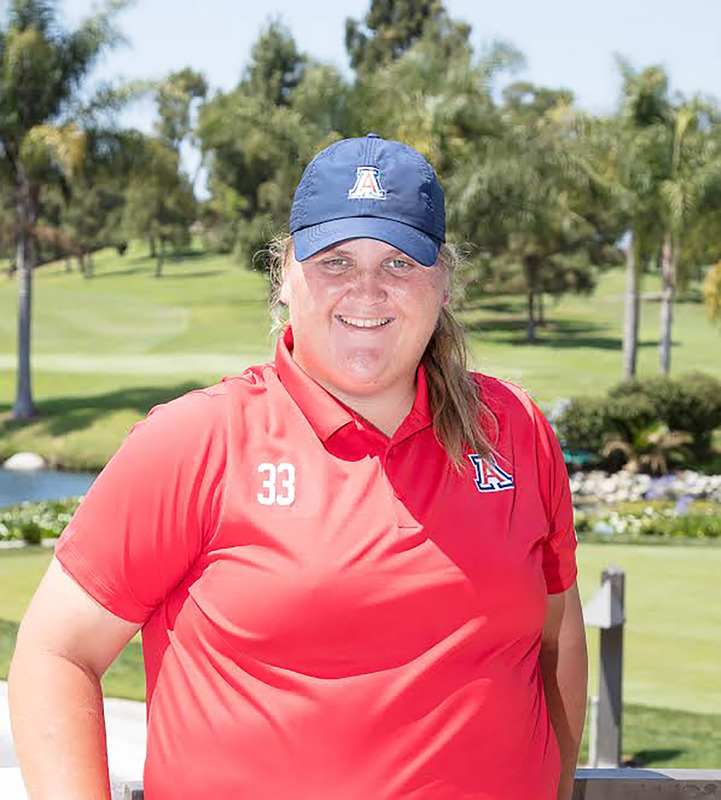 Standout University of Arizona golfer Haley Moore, an Escondido resident and San Pasqual High alum, added to her impressive list of accomplishments when she received an invite to be one of 72 golfers to compete in the inaugural Augusta National Women’s Amateur that will be held at the iconic Augusta National Golf Club this week. After earning a college degree in May and then concluding her collegiate playing career a month later, Moore is expected to turn pro and enter the LPGA Qualifying School in August. A bomber capable of showing a deft touch, Moore definitely has the wherewithal to make an impact on the next level. After leading his team to the state finals and posting some massive offensive numbers in 2018, the question is what can Orange Glen’s star running back Cael Patterson do for an encore? Tough, shifty, quick to the outside and the embodiment of stamina, Patterson was a terror on the gridiron while racking up 2,453 rushing yards and a total of 32 touchdowns. 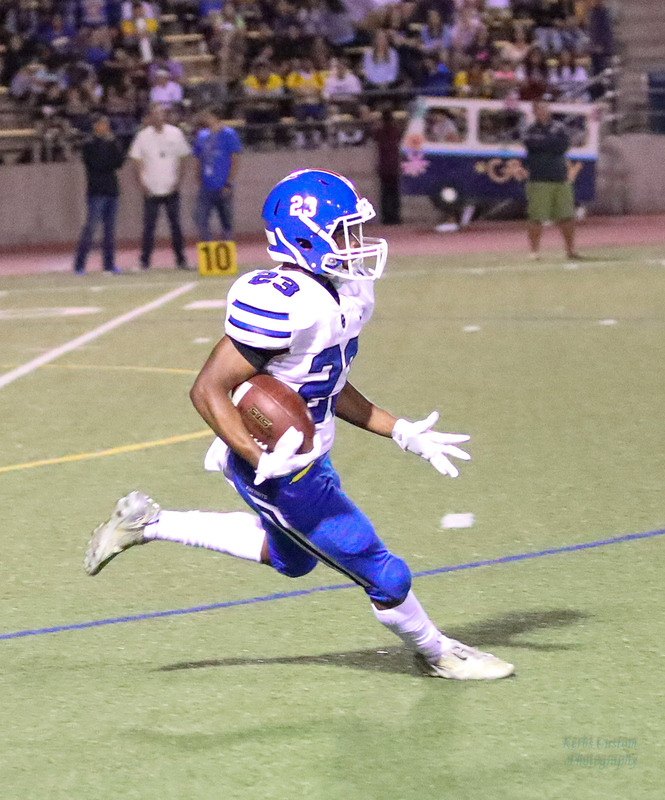 Those totals ranked second in the entire San Diego Section and justifiably earned him All-CIF honors. But with the Patriots losing some big-time contributors from their Division V championship team, more of the onus figures to fall on this singular performer during the upcoming season. With defenses making it their highest priority to stop him, it’ll be interesting to see if Patterson can somehow maintain his hefty production. But one thing I’ve come to learn about this determined athlete – if you bet against him, you do so at your own peril. On the football field, OG’s Moray Steward was a dangerous weapon who had the potential to take it to the house whenever he touched the rock as a returner, receiver or ballcarrier. But Steward’s lightning speed seems even more spectacular on the track. Already this season, Steward has made like the wind while winning both the 100 and 200 meters in two meets, Coastal Cluster # 1 and the Willie Banks Invitational. Moreover, it was the fleet-footed senior who anchored the Patriots winning 4×100 relay effort in those very same meets, thereby earning for himself three trips to the winner’s circle. A qualifier at last year’s state championships, Steward is propulsion personified and has emerged as one o the section’s most consistent and dynamic tracksters. And finally, no tears will be shed on this end over the Lakers dismal performance this season. Yeah, injuries definitely played a part in their demise but too many shady/selfish characters populated the roster. Moreover, LeBron James proved to be a poor mentor to LA’s young guns and as a result, the team became fractured. Suddenly, with James showing real physical vulnerability and with no guarantee that anyone of the high-profile free agents will want to come to join him this summer, the reemergence of the Lakers as an NBA power with the “Great One” leading the charge remains very much in doubt.